The Trident concept is very simple and extremely effective. Due to modern manufacturing techniques all darts manufactured since the mid 90's using CNC machinery have a flat face at the point end of about 3.5 - 4mm diameter. The dart point is pressed into a hole in the face leaving a square shoulder where the point meets the dart barrel. This shoulder is the cause of the vast majority of bounceouts and deflections due to the shoulder hitting the hard edge of the flight or barrel. Trident 180's are small inexpensive dart point cones that slide snuggly onto a standard point and blend the shoulder between the point and the barrel smoothly thus causing an incoming dart to glide past the flights already in the board and into the target. 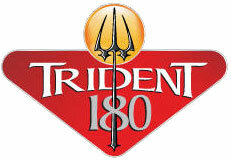 Dennis Priestley, Mark Webster and Trina Gulliver have all been helping us develop Trident 180 since we first developed the idea over 9 months ago. Trident 180s are designed to fit standard dart points that typically use a 2.25  2.40mm dart point. We cannot legislate for all manufacturers standard sizes, but even if the cones are a little tight you can place them in warm water to help slide them on. If you do play with non standard dart points that are ringed, knurled etc you may need to fit Tridents during re-pointing or persevere until your points have worn down slightly. The simplicity of the design allows the cone to snugly fit between the point and dart barrel to create a natural progression line. 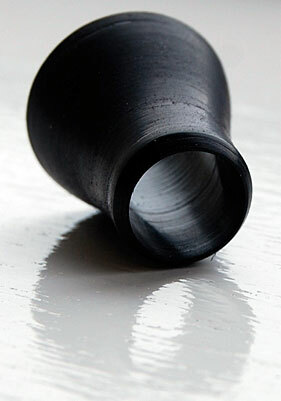 The new streamlined shape eliminates the Step Edge Fault on the majority of darts. By removing this 90 Degree shoulder or step, your darts can work with greater efficiency both in flight and on contact with another dart or leading edge of a flight. Tridents Anti-Step design means the dart can simply slide past the leading edge of the flight sticking out of the dartboard to go on and score on up to 50% more occasions. 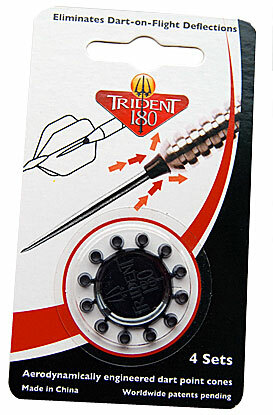 Trident 180s can give you an unmatched improvement in scoring without changing your darts. You can try this simple theory yourself by holding a dart with a Trident 180 Nose Cone fitted and then push the dart point at the flight, where it can pass the flight and continues its path to the dartboard and scoring area. With darts being a game won and lost on millimeters youd be mad not to fit Trident 180s to your darts. Darts using Trident 180 technology have less oscillation around the tip of the point in flight than darts without the Trident 180 cones fitted enabling a smoother trajectory. This is because darts without Trident 180s have a 90 degree shoulder where the airflow directs vertically off this Step which can result in greater oscillation or movement of the dart in flight. 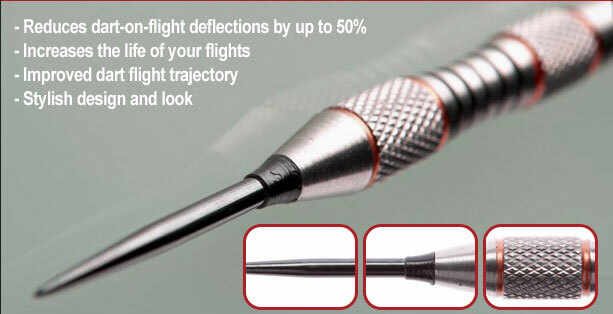 As a result of less movement in flight the airflow can travel efficiently over the whole dart with no interruptions, and reduce oscillation at the point. During our testing we noticed that Trident 180s actually serve to increase the life of your flights as the Step Edge is removed and so the flights do not come into contact with the severe shoulder of the dart, thus suffering far less impact damage. 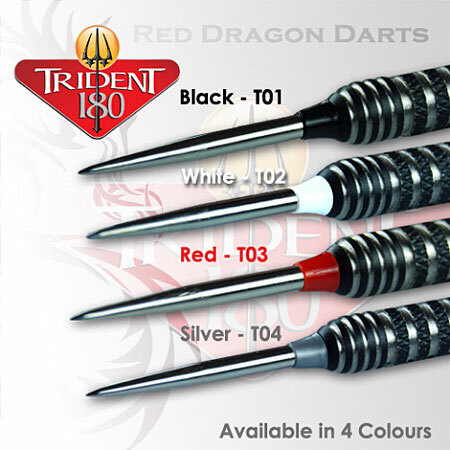 Trident 180s are available in Black, Red, Silver/Gray, or White and once youve seen your darts Trident 180s youll think they look naked without them. The concept was tested extensively using an area on a dartboard about 8 inch diameter packed with over 30 darts with 5,000 throws of darts recorded into the pack of darts, (Darts missing the area were discounted) and bounceouts were recorded using Trident 180s and without Trident 180s. Our in-house results showed the bounceout rate was reduced by more than 50% on darts fitted with Trident 180s compared to those without. Looking at the Airflow of darts in a wind tunnel we noted the air deflection on the point as air passes over the dart is significantly reduced with the removal of the Step Edge and resulted in reduced wobble by up to 8mm.